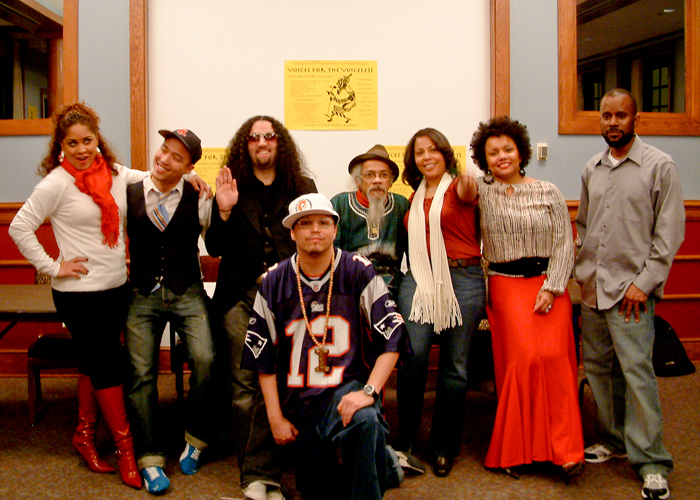 Once a year, since 1997, over 2000 students from the five college area in Western Massachusetts have gathered to hear a collection of poets and performance artists, representing the diverse perspectives of African, Latino, Asian, and Native Americans (ALANA), perform at a local college for the historic Voices for the Voiceless Poetry Concert™, one of the largest multicultural poetry events in the Northeast. With a mission to unite voices of established poets with the innovative voices of poets currently pushing the literary canon in their genre, the Voices for the Voiceless Poetry Concert™ has provided a platform for literary giants. This concert has featured poets and artists such as Guggenheim award winner Victor Hernandez Cruz, literary activist Fay Chiang, Nuyorican poetry movement founder Sandra Maria Esteves, American Book Award winner and Pulitzer prize nominee Lorna Dee Cervantes, and Fulbright scholar Roberto Marquez to share the stage with innovators in poetry and performance arts such as New York Press Club Journalism Award winner Carl Hancock Rux, Special Congressional Recognition Award recipient Tony Medina, Showtime at the Apollo Legend Jessica Care Moore, and Bao Phi, the first Vietnamese American man to have appeared on HBO’s Russell Simmons Presents Def Poetry. The Voices for the Voiceless Poetry Concert™ represents a unique opportunity to bring a symphony of multicultural, multigenerational poets to your college or university for a memorable experience of prose, poetry, and literary performance. Through the use of engaging poetry, uplifting music, and audience participation, this event will engage your campus in an honest dialogue about the importance of diversity, multiculturalism, and global perspectives. Join us and experience the program noted in 2006, by U.S. News and World Report, as one of the most popular cultural events on Amherst College’s campus. The Voices for the Voiceless Poetry Concert™ is a unique event that brings nationally and internationally renowned multicultural poets and performance artists together for a literary and cultural journey. During the evening, the poets weave language with musical interludes to create an interactive experience for the audience. The unique structure of the event allows it to be tailored to the specific needs, budget, and hot topics on your campus. South of Harlem Productions™ will act as consultants, working with you to develop the best version of this event for your student population. By creating an event that responds directly to the needs of each campus, every performance of this event is a memorable experience that is uniquely yours. 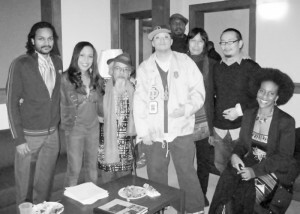 The reputation of the Voices for the Voiceless Poetry Concert™ allows us to attract poets who are icons in multicultural literature. In addition, we offer access and insight to poets and performance artists who will be the literary and theater icons of tomorrow. This balance creates a performance that is both educational and engaging. Since the Voices for the Voiceless Poetry Concert™ can be tailored to the needs of your campus, we have the flexibility to work with various budget levels. Once we consult with you, our company can provide a quote that reflects the unique needs of your campus. South of Harlem Productions™ is an independently owned and operated event management and consulting firm.